Update: Nov 7, 2008 – According to the latest news bulletins, the eruption in the Erta Ale, Africa’s largest in historic times, was due to a fissure between Alu and Dalaffilla volcanoes. Erta Ale, an active shield volcano located in the Afar Region of northeastern Ethiopia [located some 600 km from Addis Ababa,] is Ethiopia’s only active volcano. Eye witnesses said the volcano erupted late Monday. Satellite photos show the lava had covered about 300 sq km, a record area. The volcano stands 613 meters tall, with a lava lake, one of only four in the world, at the summit. It is notable for being the longest existing lava lake, present since the early years of the twentieth century. It is located in the Danakil Depression, a desert area bordering Eritrea. The area is described as one of the hottest places on earth famed for its salt mines. Erta Ale’s last major eruption in 2005 forced thousands of nearby residents to flee. Additional lava flow activity took place in August 2007, forcing the evacuation of hundreds and leaving two missing. 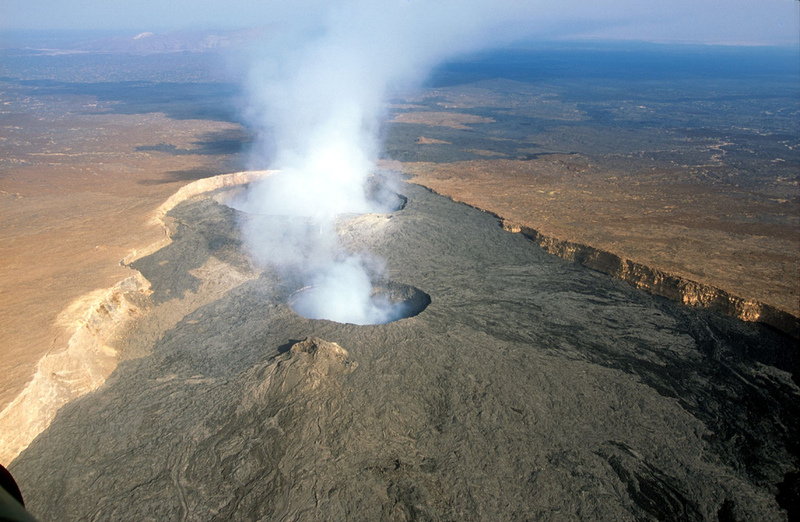 Erta Ale, Alu, Tat Ali and other Ethiopian highlands are together known as the Danakil Alps. (Sources: Addis Ababa University, various academic and news organizations, Wikipedia). Erta Ale, an active shield volcano located in the Afar Region [northeastern] of Ethiopia in the Danakil Desert, is Ethiopia’s only active volcano. License: cc-by-sa-2.0. Credit: posted to Flickr by filippo_jean. This Weekly Volcanic Activity Report summary is a cooperative project between the Smithsonian’s Global Volcanism Program and the US Geological Survey’s Volcano Hazards Program.